Unless you’re one of those rappers that likes to shoot cash out of guns to “make it rain”, you probably don’t enjoy wasting money for no reason. So why would you be content leaving money on the table for your AdWords campaigns? Aside from picking the right keywords, creating the right ads, and having the right landing page, there’s still a number of tricks that can help you increase your AdWords ROI. This article will break down 5 little known hacks that can help you keep your ad spend low and your conversions high. Some of you may be familiar with radius targeting. In a nutshell, radius targeting allows you to target users who are physically located within a certain area, searching about information about a certain area, or viewing content related to a certain area (for instance on blogs and webpages etc). And while targeting this way can be better than not filtering based on location at all, it can be refined even further, especially for businesses trying to drive foot traffic through PPC. Rather than using the default location targeting options intended to filter by anyone interested in your target area, choose to select “people in my targeted location”. Making this small change can cut down on the number of people seeing your ads that are currently outside of your current area that would not be able to take advantage of an in-store offer. While enabling this option might not be recommended for tourism businesses and other industries that rely on people making location-based searches ahead of time, it can help cut down on ineligible clicks for businesses looking to drive local traffic today. You might have heard of some of the benefits of adding ad extensions to your Adwords campaigns. They can increase your click through rates, improve your quality score, and provide a more detailed description of your offering. The problem is that with some extensions, such as call extensions, you might not be available to answer the phone during certain times of the day. And missed calls equal missed opportunities, and missed opportunities mean missed revenue. 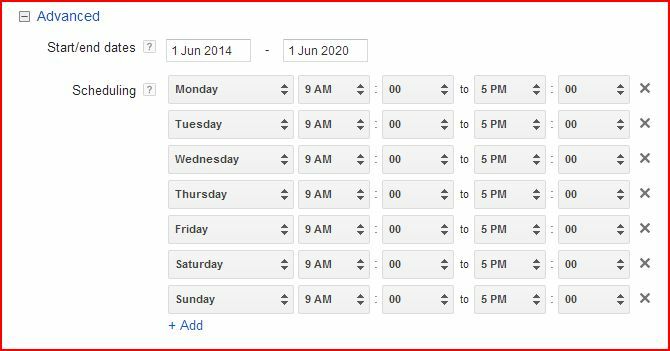 Fortunately there’s a tool called call extension scheduling within AdWords. Call extension scheduling allows you to specify the exact times you’d like call extension to appear on your ads. By enabling this feature you can select which times throughout the week, and during which calendar days, your call extensions will be in effect while blocking out periods that you’re unavailable. 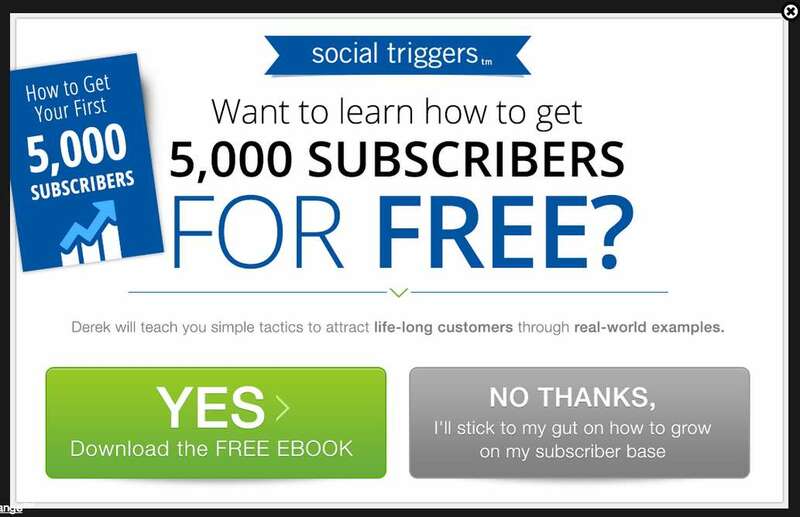 Say goodbye to missed calls and wasted PPC dollars! Remarketing is a prime example of how it’s not over until it’s over. Using remarketing you can target users who clicked on your ads and viewed your landing page, but didn’t end up converting. The problem is, with traditional remarketing you’ll end up targeting every user who viewed your page for even a split second. I don’t know about you, but showing follow-up ads to someone who wasn’t willing to read the headline of my landing page seems like a waste of ad budget to me. To get this piece of code, either speak to one of your developers or you can visit codedelay. Using this strategy, marketers have been able to save up to 78% on their wasted retargetting ad spend. If you're an adventurous marketer you might already be using the Gmail ads feature offered through AdWords. For others, you might have be on the fence or just waiting to see what it’s all about. 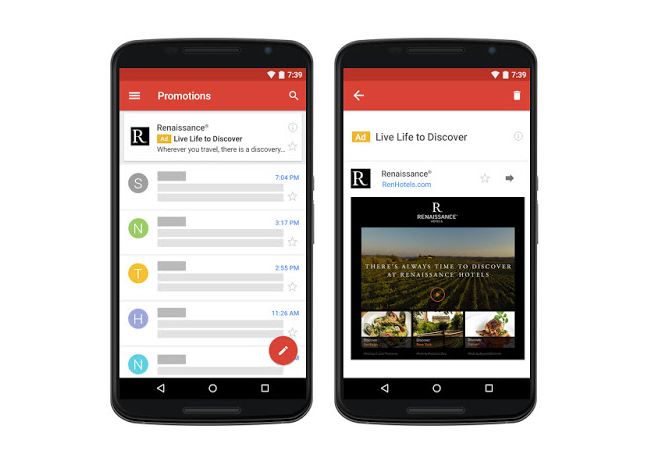 In a nutshell, Gmail ads are a feature that allows advertisers to show display ads above a user's Gmail inbox. They appear in two parts: initially above the inbox, and then in an HTML editable area that resembles an email. One of the unique selling points of this type of ads is that they allow you to target people based on the contents of their inbox rather than based on a specific search or based on demographic information. Google's crawlers will scan a user's last 300 email correspondences to determine what they’re interested in, who they’ve been in contact with, and then allow you to to target them accordingly. One trick for using this type of ads is to target users based on one of your competitors URL’s. For instance, an up and coming clothing company might target users who received emails from Old Navy. We could assume that people receiving these emails would either be on Old Navy's newsletter, or were purchasing items online and therefore receiving receipt confirmations or special offers. Using this strategy, marketers have been able to get CPC’s as low as $0.10. That’s an insanely low CPC for such a targeted campaign! Even if you keep every other part of your PPC funnel intact, adding an exit intent pop up is one sure way to increase your number of conversions and maximize the ROI from your AdWords spend. Exit intent popups work by detecting when a user attempts to bounce from your page, and will show them a popup accordingly. Take a look at this example from Social Triggers, when a user tries to bounce from their page. While users leaving the page might not be ready to take advantage of their offer at hand, that doesn’t mean that they aren’t interested in a downloading a free ebook on a related topic. By using exit popups to capture even a fraction of users attempting to leave your page, you can help to maximize the value of every PPC click and in turn your overall AdWords ROI. For more examples of how to use exit popups, check out our article 5 Exit Popups You Need to Know About. Hopefully you found these small AdWords hacks useful! Remember that increasing the ROI of your AdWords campaigns doesn’t have to mean making big changes to your ad copy or even your landing pages. Use best practices when you can and pick up a couple new tricks and tips along the way to help you optimize your paid advertising. Have you had any success implementing some of these tricks on your own campaigns? I’d love to hear your experiences in the comments below.